But in case you are experiencing problems in your game play with other .packages here you have 2 posible solutions. - The program is called Sims 3 Dashboard tool and you can download it here at mts . More info. and support at mts topic mentioned above. 2. If you are experiencing problems with .package files since you patched your game or install World Adventures, here you have the solution. Many people have been experiencing problems with .package files since they patched their games or install World Adventures. The problem seems to come from corrupted sims 3 files or either from sims 2 files mistakealy placed in your sims 3 folder. To find out if you have any corrupted files that are causing problems to your game, like lag, (none skysims file is corrupted) here is the solution found in modthesims. 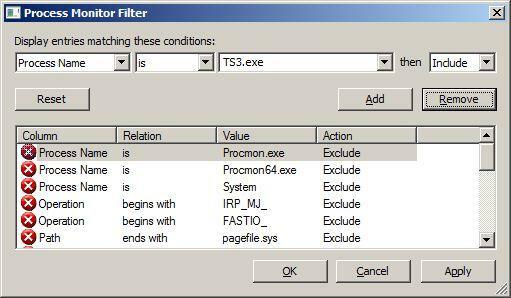 How To: Use Process Monitor to determine if your TS3 is "reloading" "bad" files all the time. Step 2. In the directory you extracted the above zip to, find and run the Procmon.exe file. (You'll have to type in the TS3.exe bit). If you use World Adventures you'll need to put in TS3EP01.exe instead. Step 6. Click Add, then OK. Step 7. You should see a Process Monitor blank screen. Step 8. Launch your game and go to a Lot. Play for a couple minutes at least. Step 9. Close the game. Step 11: Locate these files and move them (cut, don't copy) to the Desktop or directly delete. Your game will run well from then on.